DOWNTOWN — The owner of a historic house that was once a stop on the Underground Railroad lost his appeal to keep an allegedly illegally-built fifth-floor addition to the building, though authorities stopped short of ordering him to remove it. The city's Board of Standards and Appeals unanimously voted that its owner, Tony Mamounas, must appear before the Landmarks Preservation Commission, which will rule on whether or not the fifth floor on the landmarked building can stick around. Since the building is protected by the commission, it's possible the LPC would order Mamounas to remove it. The Hopper-Gibbons House at 339 W. 29th St. belonged to Abigail and James Hopper Gibbons, abolitionists who helped bring escaping slaves to Canada. The roof — still covered with years-old scaffolding and equipment from when the addition was built — served as an escape route for the family when the house was attacked during the Draft Riots in 1863. The house has been in a state of bureaucratic flux since the Department of Buildings mistakenly issued a permit to allow the construction of the fifth floor in 2005. At a hearing on Tuesday, Mamounas' lawyer, Marvin Mitzner, argued that the mistaken permit was the DOB's fault, leaving the addition exempt from the landmark protection the house was given in 2010. "Because the DOB made a mistake, my client is an innocent here," Mitzner said. The board, however, rejected that argument. "We've come to a stalemate," said Meenakshi Srinivasan, the BSA's chair. "We believe you should pursue this with the LPC." 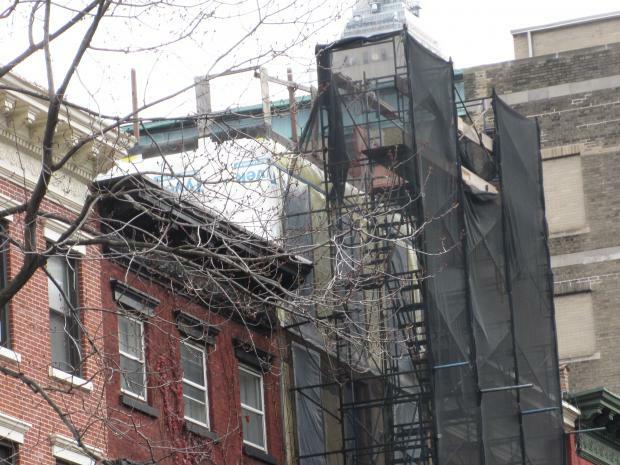 Mamounas maintains that the bulk of construction on the fifth floor happened in 2005, but preservationists said that most of the work happened in 2010, after the building was landmarked. Mitzner, who claimed that the LPC only gave the building protection because of the fifth-floor addition, said he planned to continue to fight the decision. "I will be making a stop in court," he said. "I believe the decision on this board is clearly in error." The drama around the house has united preservationists, residents, and politicians in recent years, all who hope to return the building to its original state — one that's in line with the rest of its low-rise block. Opponents of the fifth floor took the decision as something of a victory, though said the battle is far from over. "Mr. Mamounas nearly succeeded in cheating all of us of our history," said Fern Luskin, co-chairwoman of the Friends of the Hopper Gibbons Underground Railroad Site. "Given his past history, we certainly have no right to expect that what he actually builds there will conform to law."